Invoice Templates - We give our hearts out while designing, but sometimes we tend to overlook the part when we have to send an invoice to a client. But, creating an invoice doesn't need to be a towering task for you. 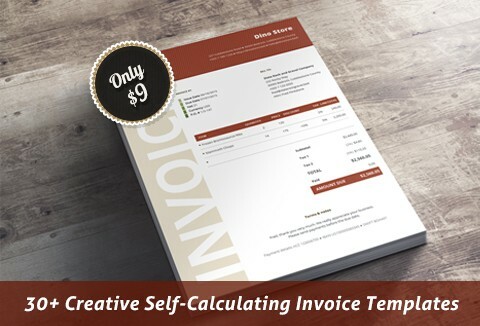 That's why, we bring you 30+ creative and self- calculating invoice templates that are not only beautifully designed but will also create your invoice in under a minute. The time you've been spending on writing invoices in Word or Excel, is yours again. The nerves too. No setup needed. Just click and go! Every template in the bundle implements a specific design psychology pattern and is crafted with care for each pixel. The color, the typography, the layout, everything has been designed carefully by professionals at InvoiceBus. This makes sure that the invoice always stands out from the crowd and gets noticed sooner. And why commercial invoice template is important for your business. The deal includes 33 HTML invoice templates, 33 Adobe Illustrator files, 33 EPS files, 33 license files, instructions, and a surprise. All fonts used are part of Google Fonts and are licensed under open source licenses. They are all loaded directly from the Google repository, so you do not need to download them separately. Ready to grab these creative invoice templates for $9?